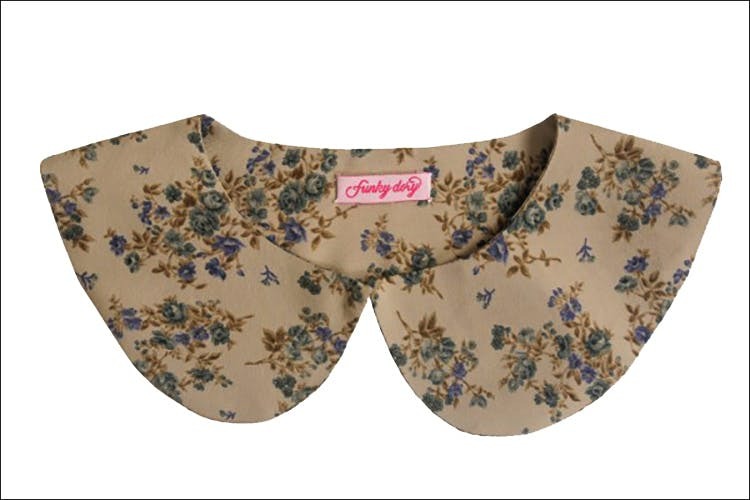 Funky Dory is a unique online brand offering women detachable add-ons like ties, bow-ties and peplums to transform their normal attire into work attire. Launched by Gayatri Thampi in August, Funky Dory is here to make dressing for work easier for the women. Haven’t we all struggled with how to dress for work? Funky Dory offers detachables that can make any outfit look formal and chic at the same time. We browsed the website and found a diverse range of collection of add-on collars. We are loving the basic add-on collars like the embellished black shirt collar to the floral one in beige colour. Have an important meeting? Strap it on your normal tee or a basic vest, and you are good to go. However, if you’re looking for something glamourous, they have a solution for that too. Golden and shiny black collars have been featured as well. Apart from this, the add-on blouses/tops are gorgeous, and act as easy wearable add-ons on any plain tee to make it look more professional. However, our favourite is the black string choker – a unique one we found on the website. They also have cute petite ties, of which one will be soon in our wardrobe. The peplums available on the site can be customised according to your waistline. The delivery time is anything between three to five working days. However, the customised orders can take up to seven working days. Formal attire on-the-go? Funky Dory to the rescue. Now no more stressed out mornings frantically looking for what to wear to the office. Just grab these add-ons- keep them in your bag and wear them wherever you like.